Our range of products include coupling style 75 / 77 for grooved pipe. MELLIABLE CASTING RS. 450 TO 1200. EACH. 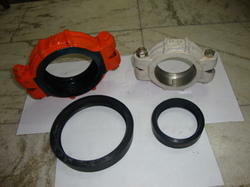 1" to 12" victaulic coupling with gasket ready stock. contact :98305 37535 & mail: das9368@gmail.com. AS PER IS:13197-1991.